We are forever indebted to so many of our supporters and are running out of ways that feel ‘big enough’ to fully express our gratitude for all that they do. One such supporter is Marco Gregotti who has tirelessly raised sponsorship in memory of his little friend, Tom. 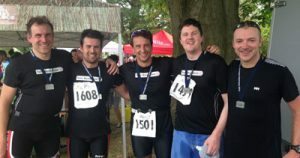 In September, Marco recruited a team, ‘Team MTT’ – Mark, Richard, Anthony, Paul and himself, who took on a triathlon at Hever Castle. We are so grateful to Team MTT for their support and for raising so much for the Trust in sponsorship. ‘Hever Castle – September 28. Cloudy with chances of rain, water temperature 14c (i.e. cold). Among the crowd you can see 5 MAMLs (Middle aged Men in Lycra) fretting around their bikes trying to pump the tyres while putting on wetsuits that used to be of the right size. They have a few things in common, they work at the same place, they look reasonably tense although they disguise the tension with nervous smiles and they are all raising funds for the Myotubular Trust: they are Team MTT. The wave starts at 10.15 –Mark, Richard, Anthony, Paul and Marco run to the start while putting their swimming caps on, there is a lot of banter and laughter, Marco slips in the lake (pond) – and he claims it was pushed (bbc4 replay will later show that it was indeed a push – yellow card for Richard) – the water is really shallow – which is great…but the downside is that now they are all wondering what is the woolly thing they are standing on? The horn blows and they are off for a 400mt swim, (one of them misses the turn and makes it 500mt) to then get changed from wetsuit into riding gear, pedal a very hilly 20km (in which some claim they got stuck behind the Ocado delivery van), get changed into their running gear and shoot for a 4km run. For some of them it’s the first triathlon, for most of them it’s the first time they raise funds for the myotubular trust…for all of them it’s a moment of great joy. Let’s do it again next year …with a much larger MTT team. Congratulations and heartfelt thanks Team MTT from the Team at the Trust!